7051 Guelph Line, north of Derry Rd. Today’s Gospel raised the question for me: “What must we do to follow Jesus?” Luke describes the call of the first disciples differently from Matthew and Mark. As Matthew and Mark describe the event, Jesus was walking along the shore of the Sea of Galilee, when he saw fishermen. He said to them, “Follow me.” Immediately they left their nets and followed Jesus. One of the verses of the old hymn, Jesus calls us; o’er the tumult of our life’s wild restless sea, puts that version of the ‘call’ very well: As of old St. Andrew heard it by the Galilean lake; turned from home and toil and kindred, leaving all for his dear sake. I have often asked myself why anyone would leave their job, their home, and their family just because someone called out, “Follow me.” In most sermons on this Scripture, the preacher points to the amazing faith of those first fishermen-disciples, then urges us to give our all to Christ, just like them. The disciples-to-be had spent the night fishing, but they had no success. 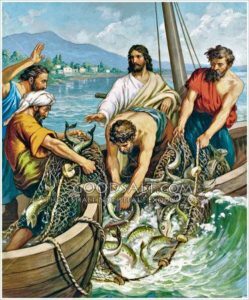 When they agreed to do what Jesus asked, they got a stupendous catch of fish. 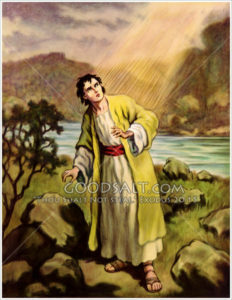 Simon Peter recognized that he had witnessed a miracle. That was why Peter, James, and John decided to follow Jesus. Though the Gospel story doesn’t explain what happened to the great catch of fish! What must we do to follow Jesus? This is a fundamental question for us, and for Christians everywhere. Certainly, some people have done so. Missionaries often travel to far off lands to spread the Gospel, leaving their homes and families, and ignoring privation and danger. Others have given up life or liberty for the sake of the Gospel – think of Oscar Romero, killed because he spoke out against a murderous regime in El Salvador. Last year, Amnesty International reported that four Iranian Christians received prison sentences totalling 45 years because they refused to renounce their Christian faith. Some hard-liners quote these examples of great courage to say that we Canadians merely play at being Christians, because we do not give up everything to follow Jesus. But sometimes we might have to choose between our beliefs and family, or home, or career. If last Friday’s Globe & Mail story is correct, Jody Wilson-Raybould put her duty as Attorney-General over job security rather than interfere in the SNC-Lavalin corruption investigation https://www.theglobeandmail.com/politics/article-trudeaus-non-denial-denial-only-muddies-the-waters-in-the-snc/. Fortunately, most Canadians do not have to make great sacrifices. We do not suffer persecution. We work at ordinary jobs, and act as ordinary parents, friends, and colleagues. Perhaps we are more like the group of women who supported Jesus and his first disciples as they travelled round Galilee. [Luke 8: 1-3]. They acted out their faith in a less spectacular way, according to the gifts that God had given them. Our own mundane activities pay for the upkeep of our church, and support our outreach mission, such as food donations for St. Matthew’s House https://www.stmatthewshouse.ca/donate-food/. However, we never know when we might be called on to make a bigger and more risky contribution. That’s what happened to Jeremiah, in our other reading. His call to ministry is typical of ‘call’ stories in the Bible. When God calls someone for a particular task, their first reaction is to try and wriggle out of the invitation. Jeremiah had a vision in which God called him to be a prophet. His excuse is that he was only a boy and didn’t know what to say. God didn’t accept that excuse. He told Jeremiah that he will put the right words into Jeremiah’s mouth, so get on and do what I tell you. Jeremiah’s excuse seems a bit like our own and that of many churches like ours today, faced with small numbers, and difficulty attracting new disciples. Our attempts to make new disciples have been unsuccessful. Our numbers remain resolutely small. We feel like Jesus’ disciples, out fishing all night, working hard, but catching nothing. No-one ever said that it is easy to follow Christ. What must we do to follow Jesus authentically? God tells us, like Jeremiah, that he will put the right words in our mouths. After all, it’s part of our baptismal covenant – to proclaim the good news of Christ by word and example. But what must we do to follow Jesus in Canada today? But – and there is a ‘but’. St. George’s is not and cannot be just a comfortable club where we meet our friends each week. Our baptismal promises call on us to do things that are hard, even unnatural. For example, just how easy is it to respect the dignity of every human being? How easy is it not to discriminate? I don’t mean overt discrimination. Rather, I am thinking of the subtle ways in which we prefer to associated with people like ourselves rather than with people who are different. How many of us, for example, have a close friend – not just an acquaintance – who is (take your pick) gay? Aboriginal? Black? Living in social housing? Likewise, how easy is it to be truly caring of God’s Creation so that our descendants will enjoy the same natural wonders that we do? Michelle and I visited the exhibition Anthropocene at the Art Gallery of Ontario last fall. It was depressing to see the myriad ways in which human activity despoils large chunks of this wonderful planet. Yet there are tiny glimmers of hope. For example, last month, Chemical and Engineering News carried an article about a waste initiative by the chemical industry to commit $1.5 billion over five years to recycle river-borne plastic waste. The new program will focus initially on the ten major river systems in Asia that – according to a 2017 study – contribute about 90% of all plastic waste reaching the oceans. Some environmentalists claim that an anticipated 40% increase in plastic production by 2030 will overwhelm recycling efforts. It’s almost impossible for us not to be part of the problem. Think laundry detergent in one-trip plastic jugs; half a dozen screws or two light bulbs in blister packs. It is not so long ago that products were dispensed in refillable containers. We buy beer in reusable bottles. Why not have reusable containers for pop and bottled water? There was another hopeful idea in the Globe & Mail this week [February 4, p. B5]. Next year, a so-far unidentified retail chain plans to introduce reusable containers as a pilot project in the Toronto area. So what must we do to follow Jesus in our world today? In all these aspects of our life as Christians, Jesus says, “Don’t give up when things don’t go well. Try again. Put out into the deeper water and let down your nets again.” Those words apply equally to those hard-to-keep baptismal promises, and to our disciple-making efforts. So let’s not give up. Try again. Put out into the deeper water and let down our nets again. St. George’s Lowville does not claim ownership of any images, videos, documents, or any other files associated with our sermons. If we have used your content and you want it removed, please Contact Us.